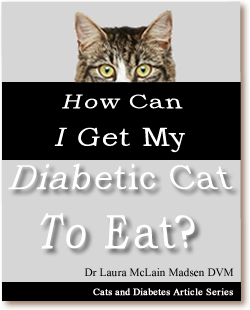 How Can I Get My Diabetic Cat to Eat? Diabetic cats need consistency in their daily schedule, including how much and what type of food they eat. If a diabetic cat is not eating well, this complicates his treatment, because if he receives too much insulin relative to the calories he is taking in, his blood sugar can fall dangerously low (hypoglycemia). If a diabetic cat won’t eat, you may need to adjust his insulin dosage. Contact your veterinarian for specific recommendations. 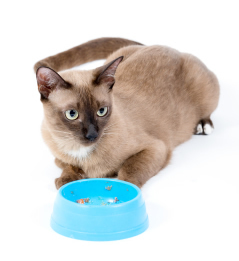 Reasons that your diabetic cat might be eating less than usual—or not at all—include food-related issues, diabetes complications, and other medical issues. He might not like the food, particularly if it is a new food to which he is not accustomed, or if it is a canned diet when he is a ‘kibble junkie’. Medical reasons for diabetic cats not eating include complications of the diabetes itself, like hypoglycemia (low blood sugar, which may make cats lethargic) and diabetic ketoacidosis (DKA). In DKA, the diabetes and metabolism are out of regulation and the cat’s body starts metabolizing its fat for energy. This results in a buildup of chemicals called ketones, which make the cat feel sick. As well as a loss of appetite, a cat with DKA may also be vomiting, lethargic, and stop drinking. Other medical disorders that might explain why your diabetic cat won’t eat include problems that sometimes can be seen along with diabetes. Kidney disease, dental disease, urinary tract infection, pancreatitis (inflammation of the pancreas), inflammatory bowel disease, cholangiohepatitis (inflammation of the liver and gall bladder), and hepatic lipidosis (fatty liver) are all conditions that diabetic cats may be prone to develop. If your diabetic cat won’t eat, the first step is to have your veterinarian evaluate your kitty. He may want to run lab work to check for disorders like urinary tract infections, DKA or pancreatitis. It is particularly important to have a veterinary exam if your cat shows other symptoms besides decreased appetite, such as vomiting, diarrhea, coughing or sneezing. If your veterinarian has determined that there is no medical reason for your kitty to refuse food, there are tricks that can encourage him to eat. If you are using a canned diet, try warming it to body temperature (the temperature of a tasty mouse or bird). Make sure there are no ‘hot spots’ if you use a microwave oven. You can tempt reluctant cats to eat by putting a small bit of tuna or cooked chicken on top of his food. Sprinkling parmesan cheese on the food is another trick, as is using a small bit of human baby food (chicken or meat flavor). You can also use a commercial freeze-dried meat cat treat: mash it up and sprinkle it on the food. Of course, none of these are nutritionally balanced for cats so you need to use a small amount—just enough to encourage him to eat his regular food. Many cats like the flavor of FortiFlora®, a probiotic made by Purina. As a probiotic it helps repopulate the ‘good bacteria’ in the intestines, which may be helpful for any ill pet, and since the flavor is appealing to cats it can tempt some kitties to eat. It comes as a packet of powder which you can sprinkle over the food. If your cat is a dry food addict, you may have trouble switching him to canned, but be patient. Cats are sensitive to texture, and going from crunchy to squishy can be difficult. The key is to go very slowly. If a cat already likes canned food as an occasional treat, you’ll still want to take at least 7–10 days to gradually decrease the amount of dry and increase the canned. But if your kitty is a real kibble addict who doesn’t want to touch wet food, you’ll need to go extremely slow, over weeks or even months. You’ll also need to put up with meowing and begging for dry food during the transition period. 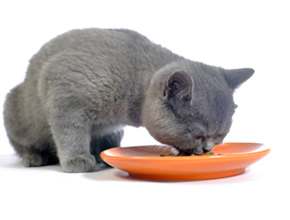 If necessary, your veterinarian may prescribe appetite stimulant medications to help get your cat eating. Cyproheptadine and mirtazapine are two such medications. Cyproheptadine is an antihistamine and mirtazapine is an antidepressant, but both have a convenient side effect of stimulating appetite. There are many reasons for cats not eating, so it’s important to figure out the reason before assuming he just doesn’t like the food. Have your cat examined by your veterinarian, and then try some of these tricks to tempt him to eat.